A few weeks ago, I was cursing former Kotaku jerk Kirk Hamilton for forcing me to play through all of Bloodborne. Now, I’m fearing the old blood just like the rest of you. First, a bit of background: I bought From Software’s PlayStation 4-exclusive action game when it first came out back in March 2015. It was my first Souls-type game, and I don’t know if I was mentally prepared for it. 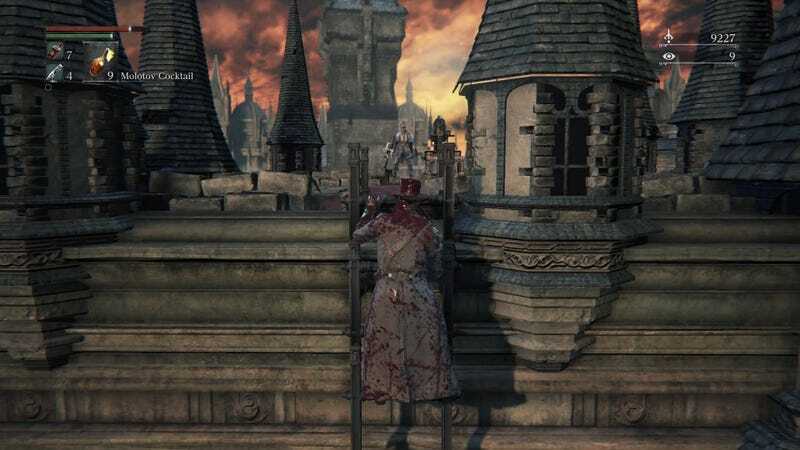 After slashing my way through Central Yharnam, slaying the Cleric Beast, and finally defeating Father Gascoigne, I arrived at the outskirts of Old Yharnam and just kinda gave up. I didn’t feel like memorizing more level layouts or slamming my head against more bosses. There were too many other games to play. So I started a new game of Bloodborne and braced myself for misery. I had enjoyed the dozen hours of Dark Souls I played last year, but I never felt a burning desire to finish it. I just figured these types of games weren’t for me. I appreciated them—the intricate level design, the embrace of difficulty as an expressive tool—but I never really loved them. I generally prefer games with more narrative structure, and so I didn’t expect to find much to love in Bloodborne today. 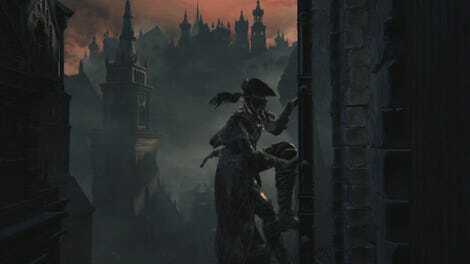 During my first session, I started re-learning the streets of Central Yharnam and re-making the same mistakes I had made four years ago. (Somehow, like a dummy, I missed the first lamp until I unlocked the shortcut leading back to it.) I defeated mobs of angry citizens, knocked on the doors of creepy laughing women, and beat the Cleric Beast pretty quickly, on my second or third try. I could not beat him. Dear reader, I spent hours and hours battling Gascoigne, hiding behind graves to dodge his shots and learning how to parry just at the right time. I used the special music box I got from his wayward daughter to stun him temporarily and get some free shots off, but it wasn’t enough. Really, he wasn’t the problem. The problem was that every time he got to 1/4 health, he’d transform into a giant beast, pin me against some gravestones, and crush me almost instantly. Finally, I decided to try something new. Instead of fighting him in the graveyard, I ran up the stairs above his house and led him to a more open area, where I could circle around his beastly form and dodge without running into any graves. Using that tactic, I defeated him on the first try. Then came my third session, yesterday. I ran through the Cathedral Ward and entered Old Yharnam, where I was greeted by a hunter with a machine gun. This was... alarming. Suddenly, something in my brain clicked. As I descended the depths of Old Yharnam’s abandoned buildings, fighting poisonous nightmare monsters and dodging machine gun fire along the way, I started to see what all the fuss was about. When I unlocked a few shortcuts and made my way back to the Cathedral Ward, hunting and exploring and seeing how the game’s brilliant maze-like levels connected to one another, I really started to see what all the fuss was about. 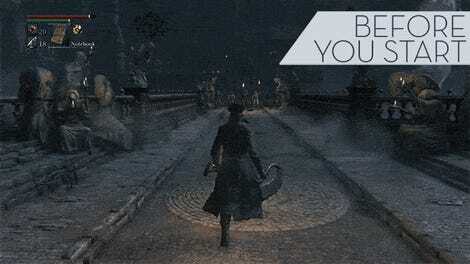 Bloodborne is a game full of satisfactions both big and small. Finding a secret area, unlocking a new passage back to the latest lantern, mastering an enemy’s attack patterns... it all adds up, and when you get it, you really get it. Then I met Vicar Amelia. I started fighting Vicar Amelia yesterday afternoon at around 4pm. She didn’t seem so tough. Big, slow brute—just gotta roll around her and take out her legs. After trying a few times, I had gotten her down to half health, but something wasn’t working. I’d get sloppy and dodge the wrong way, or I’d get pinned by a couple of attacks and die almost immediately. By 5:30pm, my eyes were hurting. By 6:30pm, my throat was dry and my fingers had started to cramp. I never thought I could hate a dog, but here we were. I took a break to make dinner and watch a documentary with my wife, then got back to it. Getting to the Vicar became second nature—killing the first couple of Church Guards to farm for healing potions, then climbing a few stairways, dodging a giant, learning how to roll just at the right time so that tall dude with the giant wooden cross couldn’t spike me on my way to the boss, and so on. I’m traveling later this week and won’t have my PlayStation 4 from Wednesday night through Sunday, so I knew that if I didn’t get her last night, I would be waiting for a long time. I went to Reddit and looked at a few posts before I found one particularly interesting tip: Turn off target locking. It seemed weird. Unintuitive. Without locking on to Amelia, how would I keep track of her and watch her moves so I could dodge the right way? Wouldn’t I get lost in a swirl of claws and fluff? Yet... unorthodox strategy had worked for Papa G, so hey, why not just try it? Bloodborne is a good video game.